Disclosure: I received a complimentary pair of Behind the Seam Designer Jeans to facilitate this review. As always, opinions stated are mine and are never influenced by comp products, tickets or services. How many of my readers remember the fabulous movie, Sisterhood of the Traveling Pants? It's one of my favorite movies of all time! How fabulous would it be to share a pair of jeans with your best girlfriends as well as the memories created while wearing them? That is the concept behind a super cool new company I discovered on Twitter called Behind the Seam Designer Jeans. 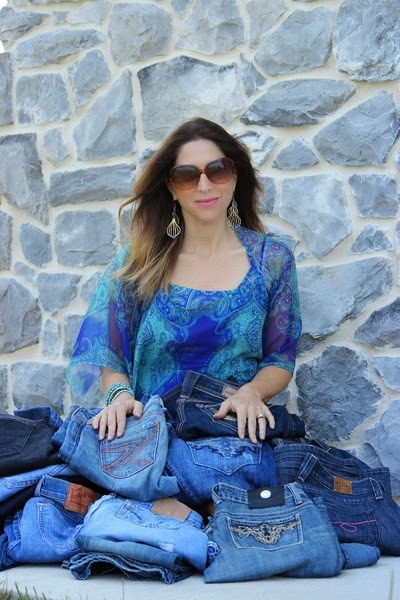 Owner and creator Natalie Alberti Salamone collects gently used designer jeans and resells them at an affordable price. The bonus is that each pair comes with a story of a special memory that happened to the previous owner while wearing the jeans. "Ever since I was a young girl, I have loved fashion and, in particular, the look, feel and quality of good designer jeans," Natalie says. "But high-end jeans are far too expensive for most of our budgets. As I began to do some online research, I found I could locate lightly worn jeans from various sources and offer them for resale." The stories that come with the jeans have added a fun dimension to the new venture and helps connect women to a common sisterhood. "Each story is a creative narrative based on true facts (told to me by the original owner) about something interesting or exciting that happened to them while wearing the jeans," says Natalie. "Our jeans have traveled all over the country and come with cool stories, so if you believe in karma, our jeans are for you!" The brands, which include 7 For All Mankind, Vigoss, Antik Denim, Citizens of Humanity, and Lucky Brand among others, range in price from $40 to $65, about 70% less than original retail prices. Natalie was kind enough to send me a pair of jeans to review for this article and I have to say, the story behind my new 575's was definitely meant for me! As someone who has been dealing with chronic pain and illness, being encouraged to believe in my dreams and to realize that anything is possible is something I desperately needed to be reminded of. I don't believe it was a coincidence that these jeans and the story behind them ended up in my hands. I love the look and feel of the jeans just as much as I love the story, too! 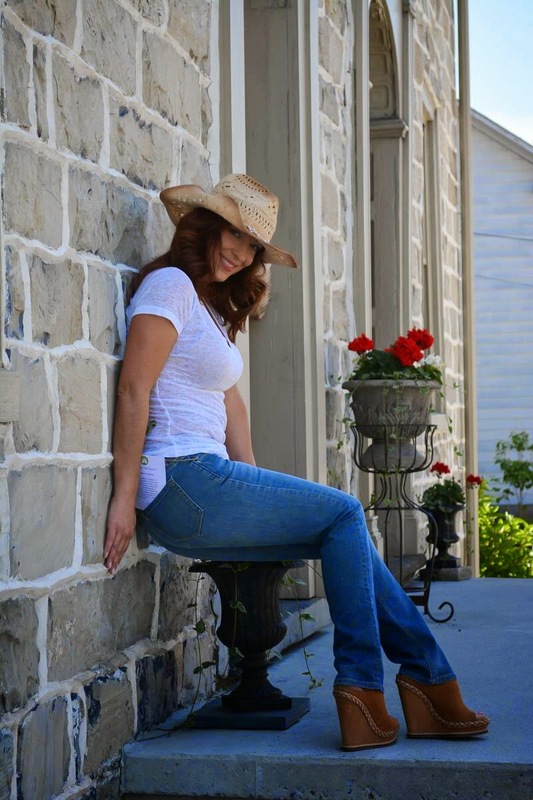 Distressed, dark denim is my favorite style...perfect for dressing up or down! You can check out all of the current jeans in stock, as well as their stories, here (click photos to display more selections in each style shown). Be sure to check back often as inventory changes frequently. Natalie also hosts "Trunk Shows for a Cause" to benefit charity and is starting a new program called "The Great Jean Makeover- Inspiring and Empowering Teenage Girls." Once a month, the program will allow a teenage girl to receive a pair of designer jeans as well as a makeover that teaches appropriate make-up application, and a headshot from a professional photographer. The program is part of Natalie's goal to empower young women. 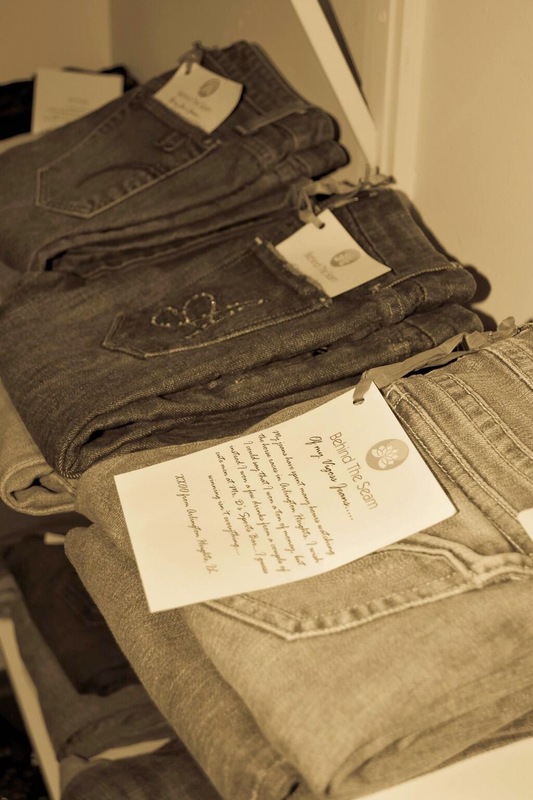 ...to empower and inspire women of all ages, religions, socioeconomic background, and races by allowing them to make connections with other women across the country through their shared stories of their beloved jeans. In addition to purchasing online or via trunk show, Behind the Seam Designer Jeans can also be found at these retail stores. Want a chance to win a pair of your own Behind the Seam Designer Jeans? Post a comment in the comment section below telling us your favorite style of jeans (skinny, boot cut, etc. ), then follow the instructions on the Rafflecopter widget below to complete your entry. Other bonus entry actions can be found in the Rafflecopter widget. Entry deadline is 12:00 am EST on Sunday, August 24, 2014. By entering, you automatically agree to all of the rules and disclaimers listed here. Please also see my disclosure policy here. Good luck! I like boot cut or straight leg in a curvy cut. I don't care for boot cut or skinny. I like a straight leg for women. Thank you! I really like skinny jeans best, i find them more figure flattering. I'm more of a bootcut kind of girl. I prefer boot cut jeans! I like straight leg jeans. I like boot cut jeans because I'm short and they fit the best with boots! I still love bootcut jeans because they balance a big waist. I like boot cut or a flare leg on my blue jeans. I like a slim fit boot cut. My favorite style of jeans are a slim boot cut. I like the boot cut jeans. i like skinny jeans best. My favorite is bootcut curvy fit. I Definately like boot cut. Looks the best on me. I like boot cut jeans the best. I am a little pregnant, so right now I am really loving the comfort of boyfriend jeans. i am a true boot cut babe! I like Straight Leg for women. Boot cut all the way! Straight Leg jeans are my favorite. Wonderful collection of dresses with such great design. Please keep updating. I will be looking forward to it. Great blog. Shoe design and dress designs are unique and beautiful.